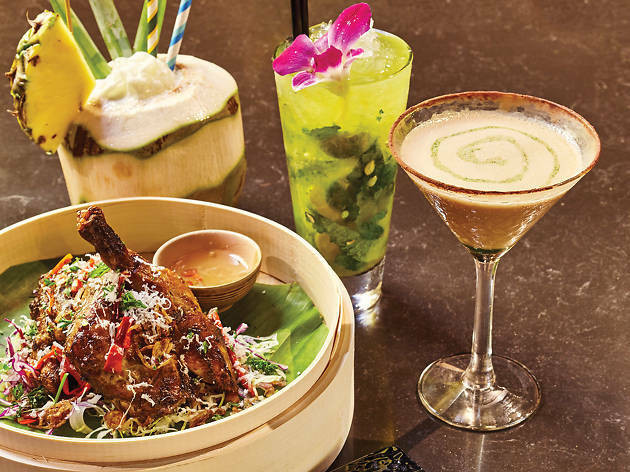 Cafés and bakeries are popping up like daisies at Lee Tung Avenue and with its shadowy ground floor entrance and bar vibe, Hei House appears to offer something edgier than most in the plush vicinity. Peeking upstairs, the restaurant is much roomier than the bar below and we can smell spices in the air. We’re curious if the exotic influences will continue to the cocktails as we head back downstairs for a quick drink. First up, we order a mango calamansi mojito ($78), which replaces lime with calamansi juice in this newfangled recipe. The result is a refreshing tropical mix and we go for a Hei-ria ($78), a concoction of sake, rum, sparkling wine and fruit juice. 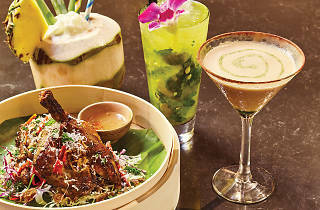 We enjoy this Asian twist to the sangria and the rice wine adds a curious nutty flavour to the classic fruity beverage. The cocktails whet our appetite for some grub and we opt for a laksa shrimp wonton taco ($98). Arriving in a steam basket, the use of laksa in combination with the crunchy shrimp and avocado works well. We visit on a Tuesday night and it was barely 10pm before we’re informed that it’s already last call for the evening. Though everything we’ve had is decent, we find ourselves cast out early for the evening. There’s no doubt the food is good at Hei House. And situated in a location like Lee Tung Avenue where people can spill on to the street inside of the complex without worrying about oncoming traffic makes it a great spot for merrymakers to gather. If only last orders weren’t so early.